We finally got some weather last week which wasn't terribly freezing so it was time to get out for a walk. This older house in the Seaton Village neighbourhood was looking quite impressive in the sunshine with a bit of snow on the roof to give some atmosphere. Hello, it is a pretty brick home. Looks lovely in the sunshine. That blue sky certainly does look encouraging! Good to walk now, isn't it?! What a gorgeous house. I wonder what the inside looks like. It looks very stately and proud. Beautiful sunshine! I like its architectural style. Its quaint and so pretty in the snow! It's beautiful and the kind of house I really like. I'll take two. BTW, I've seen several Ontario cars in these parts the past several weeks. Must be the cold weather up there. 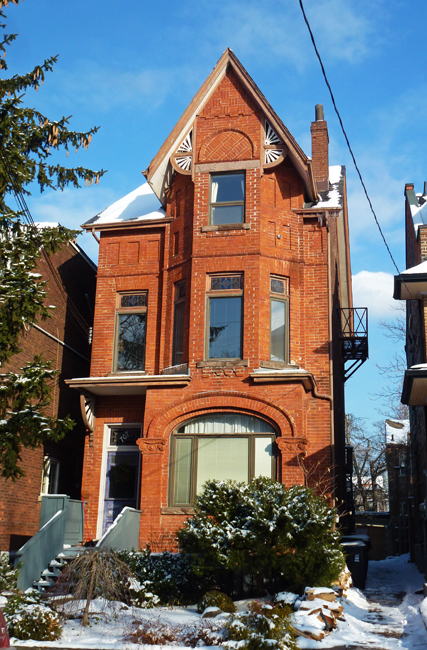 Such a lovely brick Victorian house. You caught it in perfect light. Awesome photo, I really like this house. Like a house in a story book. Those old red brick houses do look great in the winter sun. Me gusta esa fachada es muy original. Beautiful, it reminds me of Summit Avenue in St. Paul a lovely avenue of grand old mansions and other structures.